Has it really been 10 weeks since I last posted? It doesn’t feel like it! What a bad blogger to drop a bombshell like that, then disappear for three months. It’s been an absolute whirlwind of a time – lots of scans and hospital appointments and birth classes and shopping trips. Plus work has been very busy – there’s three of us on our fairly small team on maternity leave simultaneously, which is equal parts lovely and intimidating. Plus, I got diagnosed with gestational diabetes at 22 weeks (because, of course I did) which we’re treating in part with long evening walks. It’s been really nice, but it’s made a big dent in my down-time. I’m behind on everything. Not just blogging, but reading, and sewing, and TV watching as well. Being pregnant after such a long time trying is weird. Wonderful, but weird. The first GP I saw made me feel pretty horrible – like I was too fat and too old to have an uncomplicated pregnancy (and besides, I’d kind of cheated the system by using a donor). As a result it wasn’t until I was sitting in the waiting room at the hospital that I felt like I actually deserved to be there. It was incredibly heartening to see so many different kinds of women – women older than me, fatter than me, in an incredibly diverse range of races and cultures. Maybe my lingering anxiety about how long it took us to get to this point combined with that original GP’s pessimism about my chances of having anything but a very high-risk pregnancy (don’t worry – I didn’t see him again, I have a wonderful new GP) but it’s been very hard for the reality of everything to sink in. Often I feel like I just randomly have a pram in the lounge-room now, and my clothes are fitting weirdly. Oh yeah, clothes. The number one thing I heard about being a plus-size pregnant lady is that the clothes situation is hell. I’d love to tell you that it’s not that bad, but I’m afraid I can’t. It’s been pretty grim. Once I got over the unexpected pleasure of how suddenly I was allowed to have a Visible Belly Outline after years of trying to disguise it, I realised that while most of my wardrobe was oddly suited for the pregnant figure it’s quite nice not to have to feel like I have to hide that particular piece of my anatomy (and that no-one will offer you a seat on public transport if they just think you’re chubby). I’m a good eight months in now and the Bump is definitely present. 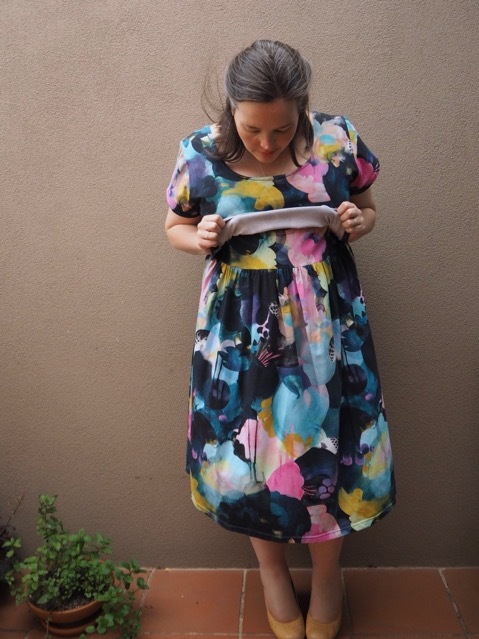 At the risk of overwhelming you all (especially those not in the same boat) I thought I’d do a run-down of the hits and misses (and misses, and misses, and misses) of the past few months of maternity shopping. So – first off: Shopping online has proven to be a bit of a disaster for me, pregnancy-wise. Which is particularly annoying, as most of the brick-and-mortar maternity shops don’t go any higher than a size 18 in some things – and the few that do seem to keep all the larger sizes squirreled out the back where they can’t pollute the normies, which means you have swallow your pride and ask the gorgeous (and they’re always gorgeous) young staff whether they could please check whether they had a particular item in size fat. That said, I’ve bought some great layering tees from Ripe, and my Mum bought me one of my favourite dresses from Soon. 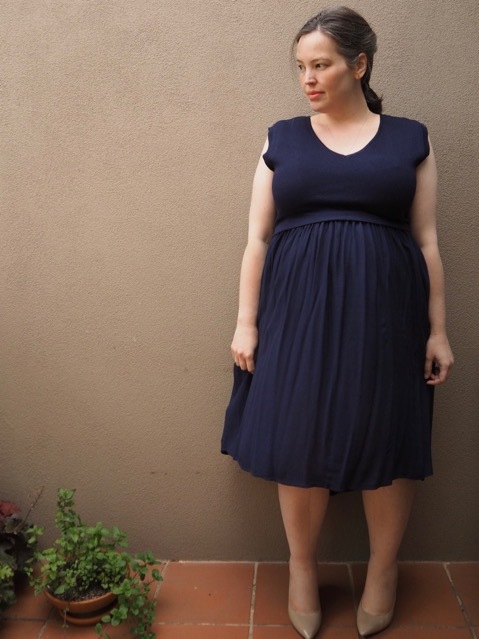 It’s a lovely navy blue number with capped sleeves and a floaty skirt, and it has the all-important nursing bit at the front which means I should be able to keep wearing it even after the little lad arrives. The boutiques are spendy though, and I learned pretty quickly that most of what was on offer either didn’t come in my size or definitely wasn’t my style. 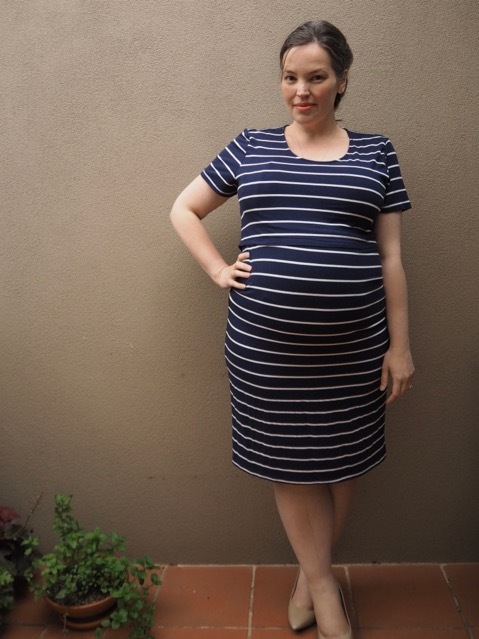 Big W, Kmart and Target have been treasure troves for basics – Black pants and leggings, singlets, t-shirts, and these cheap-and-cheerful tube dresses that are nine times out of ten either black or striped. I like stripes. I have four of these. These tube/tee dresses are great weekend basics for mooching about in, and for work I quite often add a cardigan or a drapey kimono. 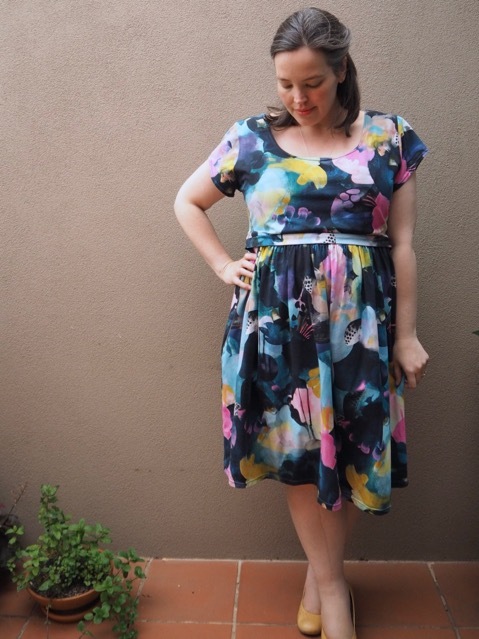 This one from Big W includes the nursing access, which is great, but it remains to be seen whether my body confidence can stand up to a body-con dress once I don’t have that societally-approved reason for the VBO anymore. 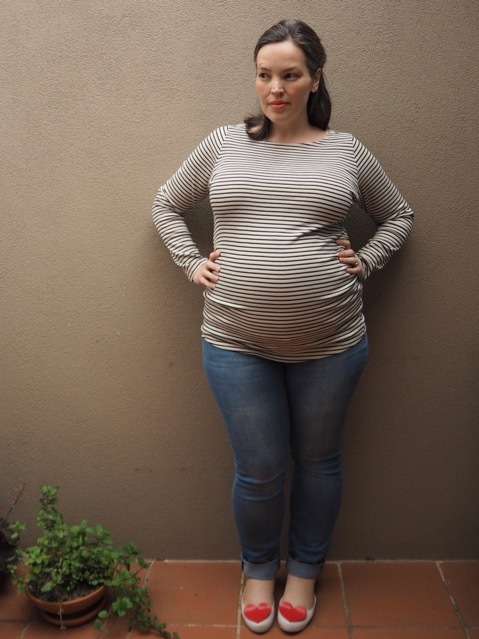 The search for maternity jeans has been the BANE of my existence, since the first cool day in Melbourne. First I did a heap of research into the best options, then I ponied up the not inconsiderable dollars and bought a pair from Good American. They’re seriously stylish, and actually very comfortable everywhere except my giant calves. I only wore them a handful of times before deciding that I didn’t want to have to struggle into them anymore. Then I tried Old Navy since I’ve had a lot of success with their regular jeans. Alas, the maternity version were too big on me, and a bit saggy. Ditto ASOS, ditto Yours. Dorothy Perkins seemed like a good bet (I’d bought some cropped blush maternity pants from there that fit nicely but I still haven’t worn) but they didn’t seem to have my size in any of the styles I bought see myself wearing. 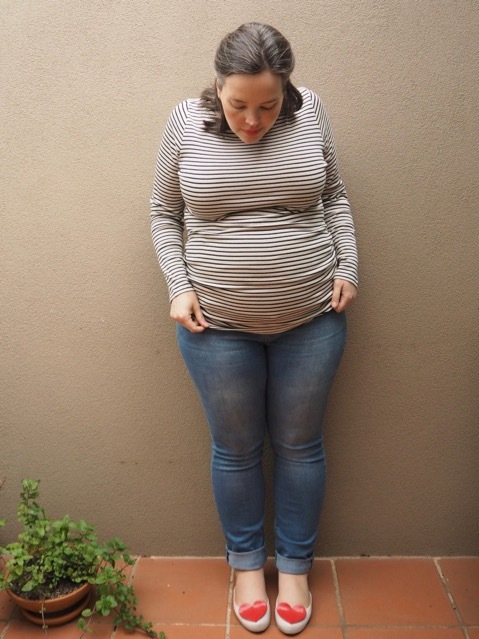 It wasn’t until someone recommended I try Jeans West that I even realised that they had a maternity range. Well, they do (yay! ), but like so many brands it maxes out at 18 (boo) and the dark denim version of the jeans that I wanted is just that little bit too tight around the calves. The black and the lighter denim fit well though, and for the sake of being able to just throw on a pair of jeans and a t-shirt I was happy enough. While we’re on the topic of Old Navy, one of my friends recommended I try them, as their ‘plus-size’ – i.e. about a size 18/20 again (What do you do if you’re bigger and pregnant? Spend the entire third trimester naked?) 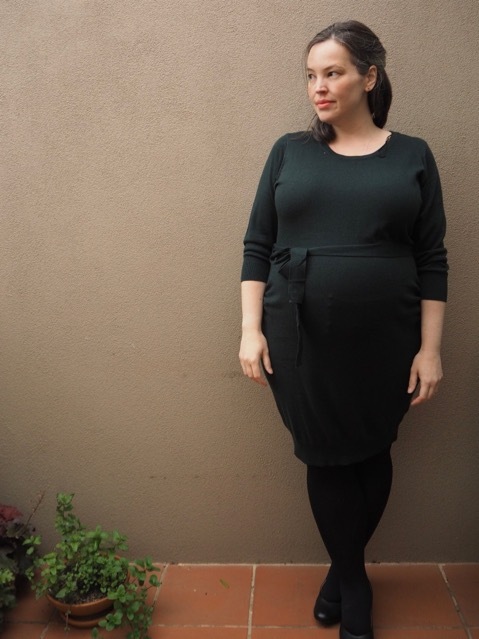 – maternity range is one of the more stylish and affordable options out there. I had no luck with the jeans, obviously, but I ended up also ordering this cute little striped sundress. True to form it was too big (seriously, all these shops tell you to order the same size as you normally wear, and then when it arrived everything seems to be cut seven sizes bigger) but I knocked an inch or two off the sides of the bodice, and now it’s the perfect summery cotton sun-dress. It came with a white cotton slip to wear underneath (for… reasons?) 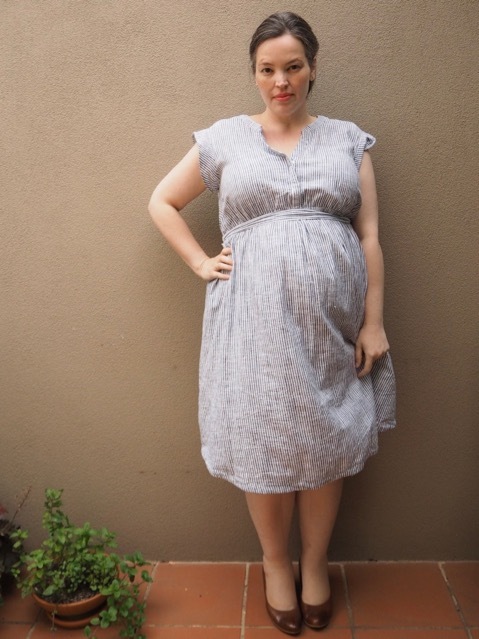 that has been repurposed as the most perfect pregnancy nightie for the 35 degree days that Melbourne has been gracing us with. I tweaked the nursing access a little, since the pattern called for a single hole bang in the middle of the under bodice, which seemed… not conducive to actual human anatomy. I probably should have trusted the patternmaker (and the reviews, which say that it works fine), but I was feeling cocky, so instead I opted for an extra-low scooped neckline on the under layer that could be tugged down entirely. This fabric is divine, isn’t it? It came from Seamstress Fabrics, and it’s a gorgeously buttery knit with a decent weight to it. Wow, this is turning into a bit of a marathon post, isn’t it? I guess I should mention Asos, since it’s the place that everyone seems to suggest for fashionable maternity wear. For me, Asos was a disaster. 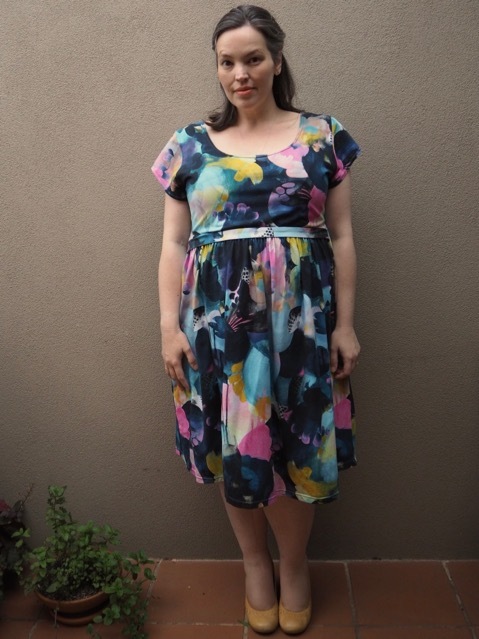 Everything I ordered – and I went back three times – was basically unwearable: Too big, too long, too short, not fitted enough, too fitted, terrible fabric… I gave up after the third time, and while I’m sure it works beautifully for lots of other people (well, people size 20 and under at least. Seriously, what are pregnant size 22+ women wearing?) it really really didn’t for me. The real surprise for me, maternity shopping was the late third-trimester discovery of H&M Maternity! I’ve never really ventured much into H&M since it landed in Melbourne. 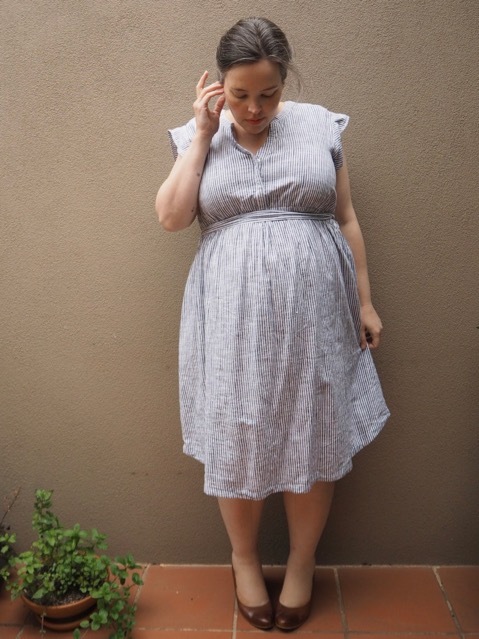 The plus size range seemed a bit half-assed and very trend-based, and it just wasn’t my thing, so the fact they had a maternity range passed me by entirely until someone in Myer’s (pitiful) maternity section suggested I give them a try. I was pretty delighted with what I found there – a plethora of tops, sweaters, dresses, even jeans, that looked good and didn’t cost the earth. I bought up big, including this green sweater dress, an equally snuggly berry sweater that does up with a ribbon at the back, a couple of basic long sleeved tees, and the softest tracksuit pants I’ve ever touched. All for less that the cost of the sweater I’d had my eye on at Ripe. Now that it’s getting cold I’m pretty pleased to be back in tights (none of my boots fit my swollen feet though *cries*). I was delighted to discover that I didn’t have to extend the whole trial and error thing to hoisery – Sonsee’s amazing stretch has meant that I’m able to wear their wonderful tights without feeling squished or uncomfortable. I also have a couple of their slips which are proving to be great layering pieces to add a bit of warmth to anything. OK. It’s nearly midnight, and this post has just been going on and on. I hope you’ve found it helpful (or at least enlightening) and I promise that the next post won’t be a whopping three months from now (probably). To sign off, and because people have asked for it… here’s a bump update. 34 weeks tomorrow, and I still can’t believe it. Thank you so much to all of you for joining me on this journey. Love you all. 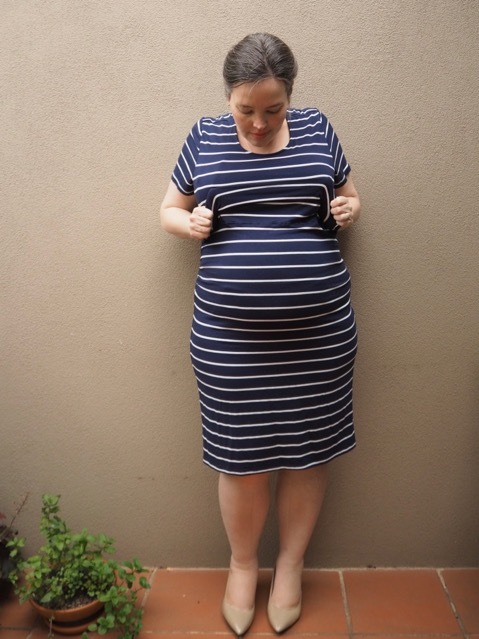 Maternity wear is a total nightmare! I spent a lot of money on Isaella Oliver clothes which were really nice quality but really WAY too expensive for stuff you’ll only wear for less than a year. 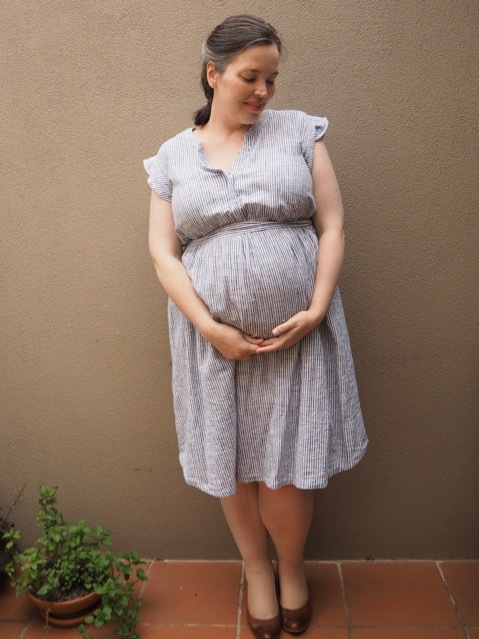 I did totally live in one long grey tank dress for most of my pregnancy, just added different cardigans and accessories. I totally got into wearing capes too, which I still wear a lot. You look fabulous… seriously glowing!! Enjoy the last few weeks of pregnancy, best of luck for delivery day. Wishing you and the Mr much joy upon the arrival of your bub! You are so beautiful! And your clothes are lovely, too. When I was pregnant 16 years ago, I think clothing manufacturers assumed small bumps. I am a slender woman, but my belly was huge when I was pregnant. So nothing store bought ever fit. 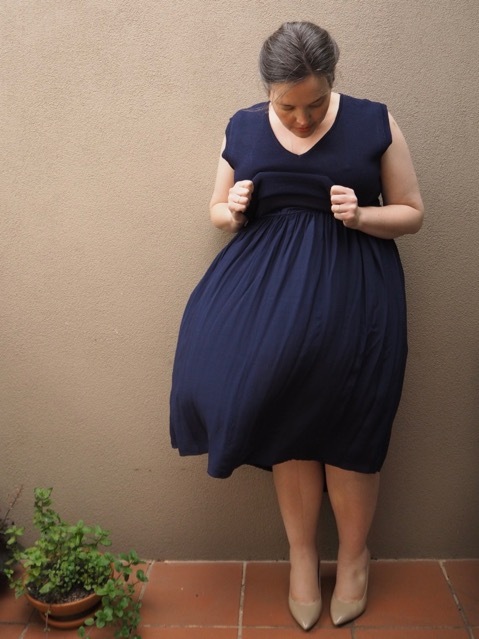 I made myself long, flowy dresses to get me through the third trimester before my 9 pound baby arrived. I wish you a safe, uneventful, and happy delivery, mama. Many blessings on you and your baby. I found pregnancy to be one of the most enjoyable experiences of my life. My body finally felt like mine after years of trying to shrink it to sizes more acceptable to “them”. I was very lucky to have an ObGyn who did not fat shame me. 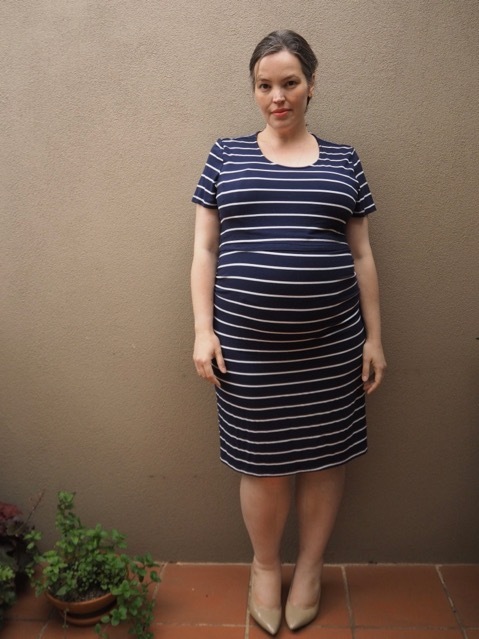 Maternity clothing was definitely trial and error and it’s so rarely on sale that I spent close to $100 on clothing I wore once and decided it was too uncomfortable to ever wear agin. Needless to say, I have been following you for YEARS (I’m not even sure how long tbh – almost since the start I believe) and you look wonderful. You seriously look more gorgeous than ever. Love the Madrid dress! All the best to you! That’s my answer. I spend my last trimester in maxi dresses. Hope this last 4 weeks goes quickly for you! You look gorgeous! Maternity clothing is pathetic, right? I’m not considered plus sized but wear size 14-16 and I struggled to find maternity clothing too. 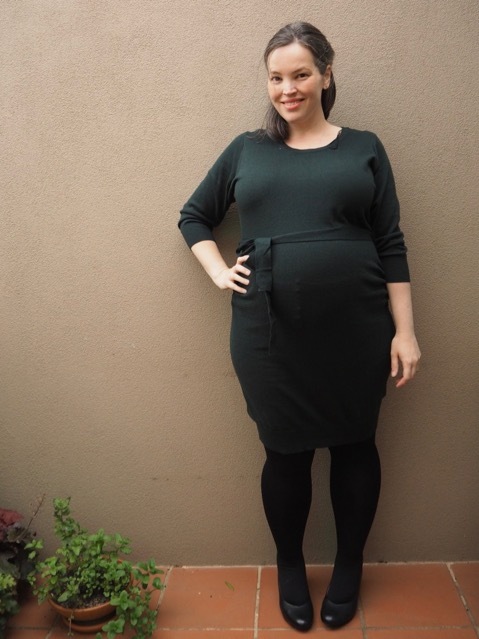 Big w at the time of my first pregnancy had maternity tights and a maternity singer in their range, so it became the joke between hubby and I that whenever I complained that I had nothing to wear, I could wear tights and a singer. Ugh! 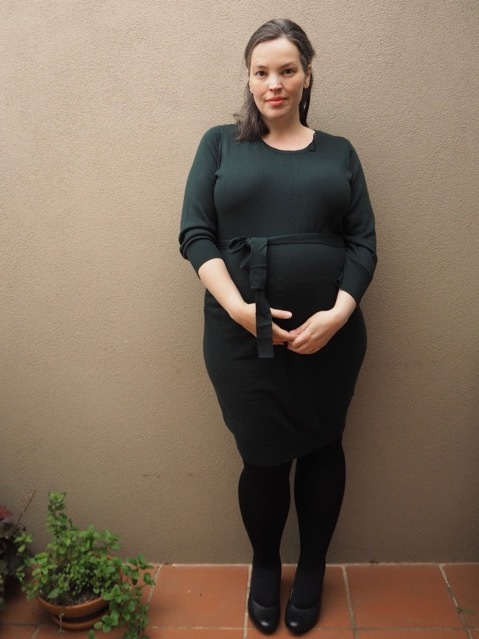 I also got a few good bits from h&m and luckily had success with ASOS dresses (but they were work out after the pregnancy, lucky they were fairly cheap!) And maternity clothing sizes are weird! Not long to go now!! Now you can do lots of gorgeous outfit shopping for bub. ? Singer = singlet. Sorry auto correct on my phone! What a brilliant post. I wish I was able to read it as a pregnant plus size girl all those years ago. You are helping so many women by sharing your experiences and it’s wonderful. Thank you! 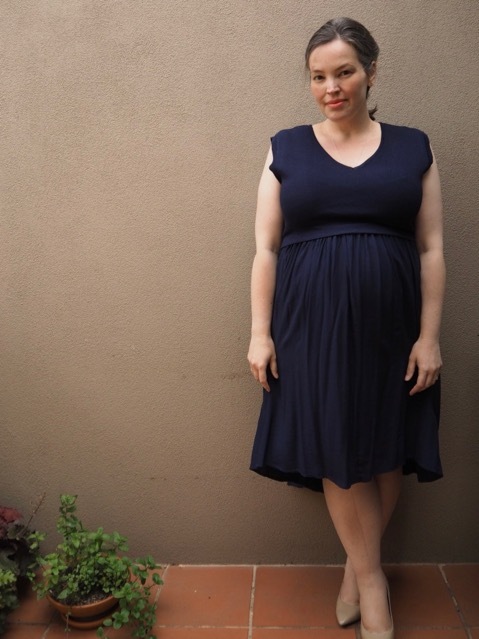 And finally, I hear fantastic things about Pink Blush, which goes up to a size 34 https://www.pinkblushmaternity.com/n-70-maternity-plus.aspx, and which carries everything from basics and day-to-day stuff all the way up to glamorous dresses for weddings and special occasions. I love the look of their delivery robes too. Lilli, you look absolutely amazing! Thank you for this post and for your blog in general, I have been a long time follower and your posts have given me so much confidence and inspiration in my own life. I am so so happy you will get to meet your baby boy soon, you have always written about the ups and downs in your life with such strength and grace, and I think these traits will serve you well as a Mum. Good luck in the last trimester and enjoy meeting your little man. Looking forward to your next post ? You look great! My youngest is 12 and the options were even more woeful back then. 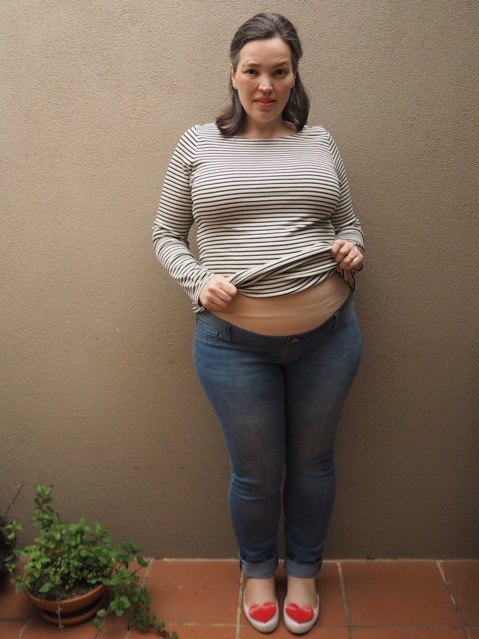 I don’t think I wore jeans for any of my entire pregnancies, although for the last one I did find some size 20 Ripe grey cords that I lived in. It’s probably a bit late now, but have you ever sewn with shirring elastic? I bought a fantastic shirred skirt from Pumpkin Patch and wore it non stop. I also got a fantastic silk (!!) shirt from their maternity range. Also, if the body con dress feels too clingy post baby, just cut it off to a tshirt. Also, I have to say it – stuff that (male!) doctor. Geez, it really makes me angry, but you have to shake it off as best you can. I had a miscarriage between my two and as it was the weekend and went to a medical centre in lieu of my GP. The guy GP confirmed I was having a misscarriage, and yes I was only 11 weeks, but he had the nerve to say “why are you so upset, women miscarriage every day”. I have never set foot in there again, but he was the arse in that situation, and as in your experience too, it was totally unneccesary and unhelpful. But that is their bad bedside manner, for them to own. Lilli, thank you for your honesty about your walk on this path. It has and will help so many people who are on a similar journey. People, like the clueless GP, will say the dumbest things sometimes. It perplexes me. Good for you for moving on and finding a good GP! Enjoy your baby and don’t let anyone get in the way of that! I’m only early in my pregnancy but at 39 and a higher bmi I feel your “you’re so high risk omg how are you even alive right now are your ovaries not dust?” pain. After years of trying no amount of fat/age shaming is going to shut me down and I hope you’ve been able to enjoy your time regardless of insensitive buffoonery from a profession that should know better. Sending you the very best as you go into your last few weeks!